An emotional vocabulary is the collection of words your child uses to express their feelings and reactions to events. Even before they learned to talk, your child was beginning to build an emotional vocabulary. When your child started turning over and couldn’t get from their stomach to their back, you may have responded to their cries with "Oh, that’s so frustrating for you!" When your child breaks a favorite toy and begins to cry, you probably tell them "I understand that you’re sad." And when your child doesn’t get what they want and stomps and yells at you, you likely respond with an "I know you’re mad at me." Why is an Emotional Vocabulary Important? Many parents provide words for the strong and common emotions children feel, like happiness, sadness, and anger, but we sometimes overlook the fact that there’s a large and varied vocabulary of emotion. Children need a larger pool of words to draw on to be able to express all their emotions as well as to be able to read the cues that indicate other people’s feelings. Being able to sense and understand the emotions of others is a big part of a child’s social development and social success. If your child can read the emotional cues to get a sense of how other children are responding to their attempts to connect with them, they are more able to respond appropriately. This is the foundation on which the ability to create and maintain friendships is built upon. How Do Kids Develop Emotional Literacy? Together, the skills of identifying their emotions and reading and responding to other people’s emotions combine to create a skill known as emotional intelligence or emotional literacy. It would be nice if the ability to read cues and to respond in a socially appropriate manner was innate, but it’s not. Kids develop emotional literacy by social experience and by being taught. Some children, like children with Autistic Spectrum Disorders, have more difficulty than others learning emotions and need more extensive teaching than others. Kids learn via teaching, but they also absorb the lessons that are going on around them. It’s a good idea to begin to talk through your own feelings and reactions with a variety of different words. For example, instead of swearing at the computer screen when it freezes, take a cleansing breath and say, "I’m so frustrated this keeps happening. I’m worried I won’t get my work done on time if I can’t fix it." 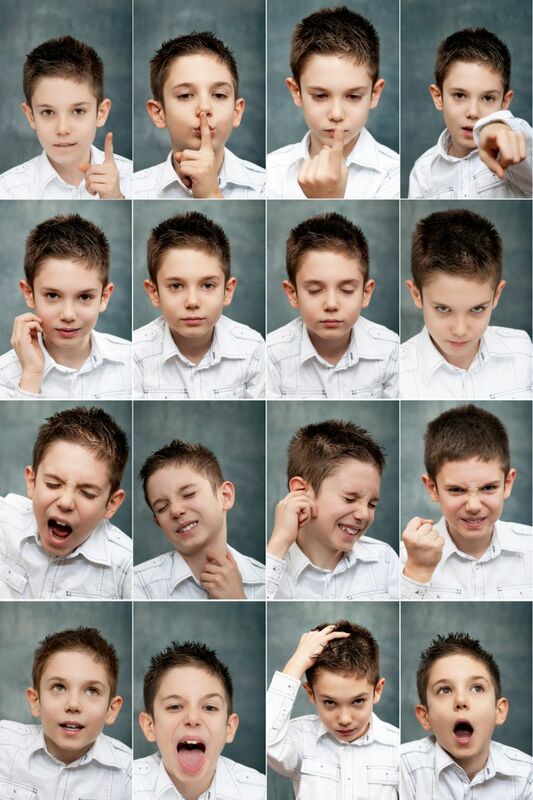 The Goal of Activities: To help your child identify and name a variety of different emotions. Skills Targeted: Emotional intelligence, verbal communication, social skills. There are many other ways you can help your child increase their emotional literacy. Make a Big List of Feelings. Grab a really big piece of paper and a marker and sit down with your child to brainstorm all the feelings you can think of. Your list may include emotions your child doesn’t recognize, but that’s okay. Make the face that goes with the feeling and explain a situation in which that feeling may come up. Add feeling noises to your Big List of Feelings. Children don’t always know how to identify an emotion by word, but they may know the sounds that accompany them. For example, your child may not know the word "worried," but they may know that "uh-oh" or the sound of air sucked in through your teeth goes with that same feeling. Try to stump your child by providing a sound that can be paired with a number of emotions, like a sigh that is associated with fatigued, sad, frustrated and irritated. Read books. Literacy and emotional literacy don’t have to be taught separately. There are many great books that specifically explore emotions, but you can find feelings in any story you read. When you’re reading to your child, ask them to help you figure out what the main character is feeling in certain situations. Use the pictures and the plot as clues to help. Play Emotional Charades. This is a fun game to play with your child. One of you picks an emotion to convey to the other, using either your whole body or just your face. If your child is having trouble making sense of the faces, give them a mirror, ask them to make the same face as you and look in the mirror. They may be able to see the feeling on their face better than on yours. Change up the "Happy and You Know It Song." Add new verses to this familiar song, using new emotions. For example, try "If you’re agreeable, and you know it say 'okay.'" Make a Feelings Collage. Give your child some paper, scissors, glue, and old magazines. You can either provide a list of feelings that they need to find faces to match or have them make a collage of faces and tell you what the emotions are. When they're done, label the emotions and hang the collage somewhere where it can be easily accessed. Keep a Feelings Journal. A feelings journal is a good way for your child to keep track of their emotions and the situations in which they feel them. Role-play and review. One of the best ways to increase emotional vocabulary is to role-play or to create social narratives. Come up with scenarios your child might encounter and have them act out how they might act and react. Alongside role-playing comes reviewing. Go over situations that didn’t end well, examine the emotions of the people involved, and talk with your child about what could have been done differently. We're Having a Tuesday by DK Simoneau. Glad Monster, Sad Monster: A Book About Feelings by Anne Miranda & Ed Emberley. Don't Feed the Monster on Tuesdays! by Adolph Moser. Today I Feel Silly: And Other Moods that Make My Day by Jamie Lee Curtis. My Many Colored Days by Dr. Suess. Dealing with Feelings by Elizabeth Crary. When Sophie Gets Angry-Really, Really Angry by Molly Bang. If You're Angry and You Know It by Cecily Kaiser. The Way I Feel by Janan Cain.